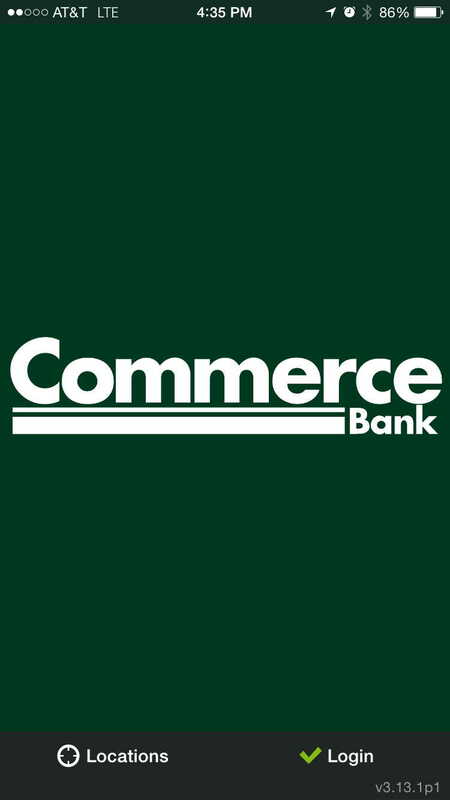 This is the Commerce Bank Mobile Banking for iPhone App Icon. 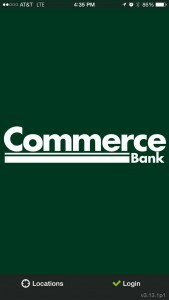 You can download the Commerce Bank iPhone App at the Apple App Store. Accounts lists all of the accounts associated with the user, including deposit, credit, and loan accounts. Select an account to view specific transactions for that account. Select a transaction to see details about that specific transaction. Select Home to return to the Home screen. Select Log Out to log out from the app. 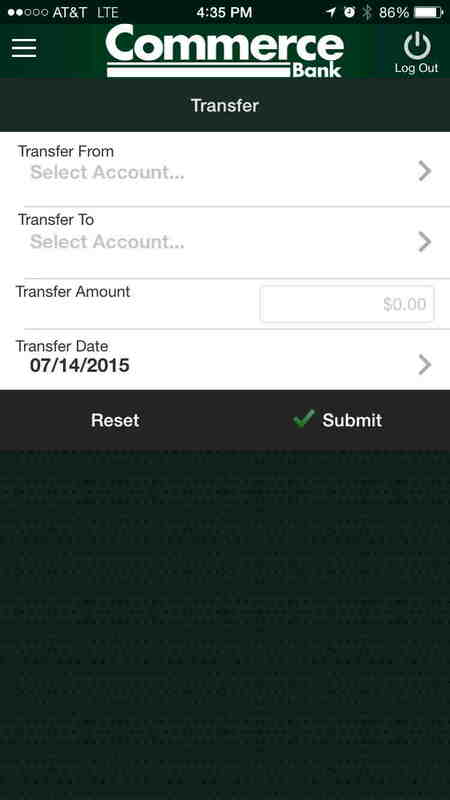 Transfers allows you to transfer funds between accounts. From the Home screen, select Transfers. Select Transfer From to choose the source account. Select Transfer To to choose the destination account. Depending on your destination account choice, you may need to choose a Payment Type, i.e. the destination account is a loan. Select Transfer Amount to enter in the amount to be transferred. Select Transfer Date to choose the date of the transfer from the calendar. Select Submit to transfer funds. A confirmation screen appears. Select Make Another Transfer or Home Screen to continue. 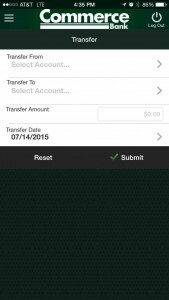 Bill Payments allows you to pay bills through your mobile device from accounts connected to Commerce Bank Mobile Banking for iPhone. You may only pay bills. You cannot set up a new payee. 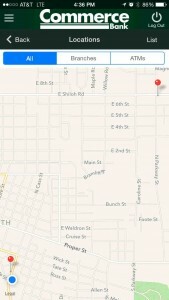 This must be done from the desktop web site. From the Pay Bills screen, select the desired payee from the Payees column. 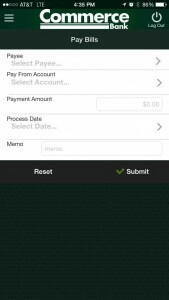 Tap the From Account field to select the account from which you want to make the payment. 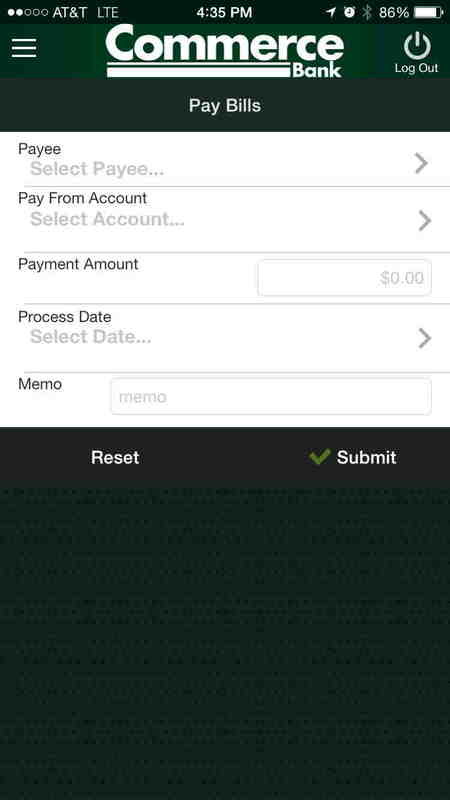 Tap the Amount field to enter the payment amount. Enter an amount to pay in the Payment Amount field. Select Process Date to select a payment date from a calendar. 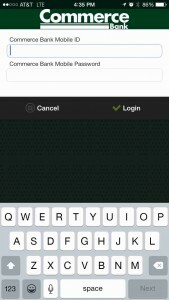 To add a personal memo, select Memo and enter your memo. A payment confirmation screen appears after you’ve completed a successful payment. Select Make Another Payment to start the process again, or select Home Menu. Select a card to see what specific actions can be performed for that card. 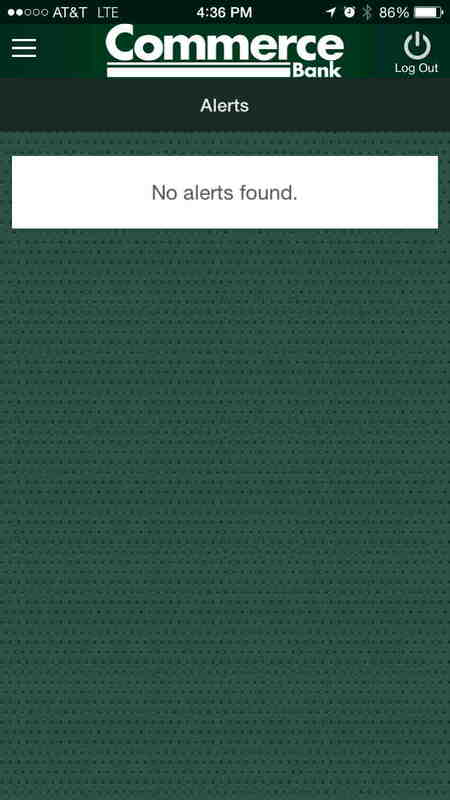 Alerts lists the current alerts created by the user. You can create multiple alerts for events such as statement availability and high account balance. 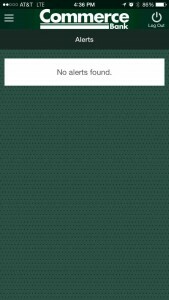 Locations allows you to search for branch and ATM locations on your device, either through a manual search based on Zip Code or City/State or through use of the device’s GPS. Use this option to edit your preferences. For iOS devices, select Touch ID to enable or disable touch ID functionality. Touch ID allows you to use your fingerprint to log on. 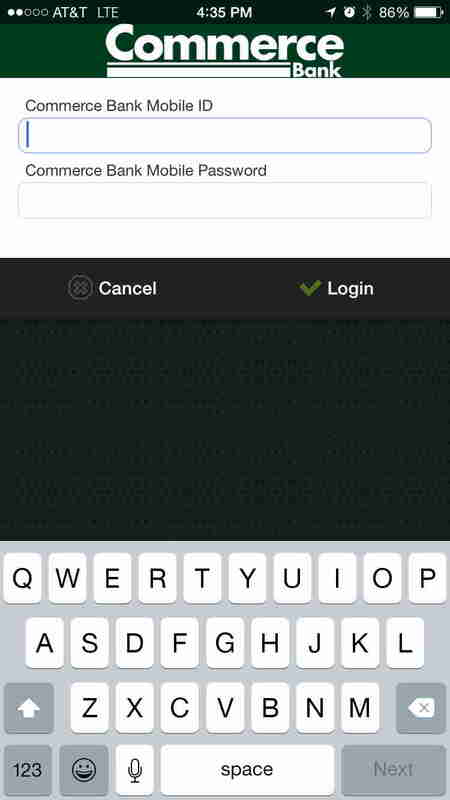 Tap Select Landing Page to select the default landing page, which appears upon logon. Tap Change your login password to change your password. 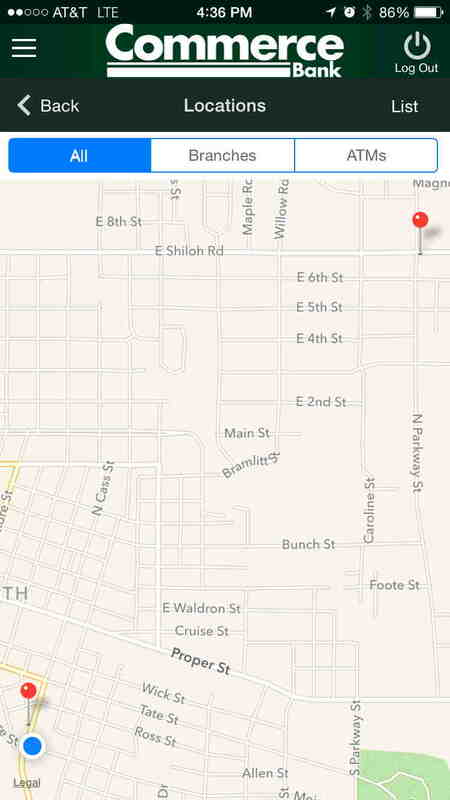 Call us at (662) 286-5577, stop by our Main Office at 306 South Cass Street, or click here to contact us electronically.